It has come to the attention of the American Red Cross that you are using the emblem of the American Red Cross in connection with your Grunt Doc website. The red cross symbol is a protected trademark of the American Red Cross. Your use of the emblem of the American Red Cross is considered unauthorized. Whoever wears or displays the sign of the Red Cross or any insignia colored in imitation thereof for the fraudulent purpose of inducing the belief that he is a member of or an agent for the American National Red Cross; or Whoever, whether a corporation, association or person, other than the American National Red Cross and its duly authorized employees and agents and the sanitary and hospital authorities of the armed forces of the United States, uses the emblem of the Greek red cross on a white ground, or any sign or insignia made or colored in imitation thereof or the words Red Cross or Geneva Cross or any combination of these words Shall be fined under this title or imprisoned not more than six months, or both. 18 U.S.C. 706. This statute is brought to your attention in the belief that you may not have been aware of the above prohibitions. As you can see, federal law expressly prohibits unauthorized parties from using the Red Cross name and emblem and imposes criminal penalties for violations. Furthermore, the emblem is also a federally registered trademark. Therefore, your misappropriation of the emblem also violates federal and state trademark law, unfair competition law and anti-dilution law. Attached is a brochure that explains the unique status of the Red Cross emblem and why protection of it is so important. The American Red Cross insists that you immediately refrain from all current and future uses of the American Red Cross emblem in connection with your Grunt Doc website and in all other aspects as well. You must either (i) change the color of your cross to a color other than red or a shade of red or (ii) stop using the cross symbol altogether. Thank you for your attention to this matter. Please contact me to advise me of the corrective action taken. Ah well, it always bothered me that some readers might mistakenly think I was affiliated with an organization that is full to the gills with corrupt beauracrats and graft anyway. Clara Barton would be ashamed of them today. I remember when I needed to take emergency leave from Japan when I was in the Navy. The American Red Cross offered to give me a loan of $70 for the emergency trip home. Seventy dollars at 17% interest to travel from Japan to the United States. I have never forgotten that. With their institutionalized ignorance, arrogance, and corruption clearly showing after hurricane Katrina I'll never donate to them or volunteer for them again. I do not wish to be associated with them in any manner. Therefore, my sidebar icon is changed. Like a lot of vets, I also will have nothing to do with the Red Cross. Having to hijack donuts from them in Korea because I was Air Force and they "were there to serve the Army", started the bad taste. Then in Japan, I had my brother send me some money through them,(I was TDY and had no address),they tried to get me to pay for the telegram and a service(handling)charge for my money though both had been paid by my brother on the sending end. I wish there was some other way to donate blood, then I could resume that practice. Give to the Salvation Army. They do more with less, and don't get rich in the process. Ditto to the setiments. 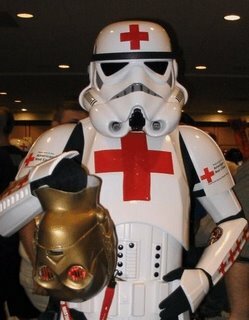 The Red Cross has been taken over by the pod people or something. Sounds like they like what is theirs is theirs and what is yours in subject to fees. Where does all the money go anyway? Like we don't already know. And all this time I just thought that was symbol for nursing. How exactly were they able to register that in the first place? A red cross on a white field is a St. George's cross. Funny, my alarm pad has a panic button for medical and it's a red cross. Somehow I doubt they got permission to use it. Methinks they are struggling to defend a public symbol and would lose if it went to court. The symbol pre-dates the organization. You could always switch to a blue cross. see plenty of those on ambulances where I'm at. "The Greek Red Cross emblem and the American Red Cross name are federally protected marks of The American National Red Cross (see United States Code, Title 18, Section 706)." That is at the bottom of the Red cross site. Although they might change there symbol completely. and I don't think you can use a blue cross either. Blue Cross Blue Shield has the symbol for mankind in it and is used in conjunction with a shield. They have no trademark of a plain blue cross. Actually that statute was written by the US government, not the red cross. They are just doing what they have been doing for year, covering their asses. Why your website was found by them, indicates that they have waaay too much time. They hired my sister-in-law, and she is a total screw-up. That says it all for me. Many (if not most) major hospitals maintain their own blood banks. You can donate there and avoid the Red Cross bureaucracy entirely. They usually are much more grateful, too. I worked for this horrendous institution and to a person, everyone I worked with was completely abused. Said one colleague who, still bald from recent chemotherapy, "In the past year, I've been through breast cancer and I've been through the last year working here. If I had to do either again, I'd choose the cancer". From the inside, I saw clearly the place is so corrupt, they have layers of managers protecting the corruption fo the managers above and below them. If someone comes in to change it, they whip them until the submit or leave. Volunteers are taken for granted adn treated like crap. It's important to know that the corruption is among the management - the volunteers and below management level employees are truly committed to the mission. They just have to sell their souls every day and take unheard of employment risk in order to take the high road - the retribution is off the charts. The red cross emblem does not actually belong to the red cross. It belongs to Johnson & Johnson, who allow them to use it in nonprofit ways and recently took them to court because the red cross licensing the emblem to make a profit. Obviously, they have no competent employees. Yep, definitely a bunch of incompetents are running the show. Too bad.